No Israeli government will survive or support any concessions made on Jerusalem and it is time for the U.S. and the international community to recognize this. US Secretary of State John Kerry has blamed the sudden deadlock in peace negotiations between Israel and the Palestinian Authority on Israel's plans to build additional apartments in Gilo, a southern Jerusalem neighborhood beyond the Green Line. This indicates America's profound misunderstanding of the situation. With over 40,000 residents, Gilo is to be part of Israel under any agreement. More importantly, the peace negotiations have little chance of succeeding as long as the Palestinians demand the partition of Jerusalem. The Palestinians and most of the international community fail to understand that the past offers made to divide Jerusalem – by Ehud Barak at the Camp David summit in 2000, and repeated by Ehud Olmert in 2007 – were divorced from the strong attachment a majority of Israelis feel towards the eternal city. The willingness of Barak and Olmert to divide the city completely lacks domestic political support. Furthermore, strategic considerations also dictate that Israel hold onto greater Jerusalem as a united city. Israeli public opinion is committed to maintaining the status quo in Jerusalem. All polls show that over two thirds of Israelis feel that Jerusalem should remain the united capital of Israel, while only 20 percent favor dividing the capital between the Jewish state and a future Palestinian state. The group of Israelis expressing the strongest support in favor of Jerusalem remaining the undivided capital of Israel (almost 80 percent) is between the ages of 18 and 24. Of this group, even stronger support was expressed by Ultra-Orthodox and religious Israelis who are the fastest growing segments in the Jewish population. When asked whether Israel should relinquish control over the Temple Mount in Jerusalem, the holiest place in the world for Jews, over 70 percent of Israelis disagreed. After Barak's offer in 2000, over 250,000 people demonstrated in opposition to Barak's violation of the Jerusalem taboo – the largest rally ever held in the city. The electrifying hold of Jerusalem on the Jewish psyche is not sufficiently appreciated. Moreover, an Orthodox injunction against visiting the Temple Mount has eroded, allowing a growing number of Israelis the spiritual experience of ascending the Mount and conjoining the metaphysical past and future. Such feelings are politically potent, foreclosing the possibility that Israelis will sit idly by and abide a transfer of sovereignty in Jerusalem. In 2000, the division of Jerusalem lacked the necessary majority in the Knesset and Barak's coalition subsequently disintegrated (for this and other reasons). Similarly, in 2008, Prime Minister Olmert experienced coalition difficulties because he placed Jerusalem on the negotiators' agenda. 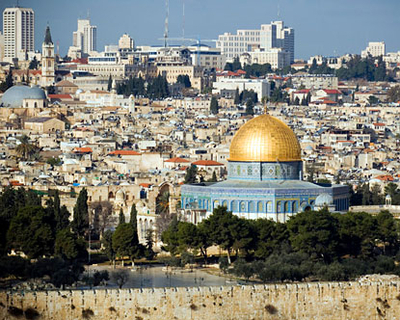 No Israeli government is likely to survive concessions regarding Jerusalem. If elections are held in the near future, the strength of the opposition to any concessions in Jerusalem is only likely to grow. Jerusalem's importance to Jews is not only historical and religious. The city also holds strategic importance in controlling the only highway from the coast of the Mediterranean Sea to the Jordan River Valley, along which military forces can move with little interference from Arab communities. Jerusalem is the linchpin for erecting a security zone along the Jordan Rift that Israel insists on. If Israel wants to maintain a defensible border in the East, it needs to secure the east-west axis from the coast to the Jordan Valley, via an undivided Jerusalem. Keeping Greater Jerusalem, which includes the settlement blocs that President Bush recognized as realities that must be accommodated in a future settlement, is a strategic imperative. The military importance of Jerusalem and Jerusalem's central role in the eastern line of defense for Israel cannot be ignored, especially given the immense potential for political upheaval east of the Jordan River. Designing stable defensible borders in accordance with current, but transient, state-of-the-art technological and political circumstances is strategically foolish. The turmoil of the past few years in the Arab world suggests the need for great caution. The partition of Jerusalem is also a bad idea given the history of cities such as Berlin, Belfast or Nicosia. Why should Jerusalem be different?! Jews have held a majority in the city for the past 150 years, while Jerusalem has never been the capital of any Arab or Muslim political entity. Moreover, the Arab minority in the city has clearly shown its preference for living under Israeli rule. Many Arabs have moved to the Israeli side of the security barrier being built around Jerusalem. Polls show that a large majority of Jerusalem's Arabs oppose being subject to Palestinian rule. Their choice is understandable, since Jerusalem offers the quality of life of a modern Western city; while only a few kilometers away, a Third World standard of living and religious intolerance are the norm. An undivided Jerusalem is the best guarantee for a better life for all Jerusalemites. In sum, the unreasonable Palestinian demand to divide Jerusalem is an obstacle towards a better future.